In 2016 The Sound of Safety will introduce a new evacuation central in the market. The current technique, in combination with innovative improvements, will lift the quality of the product to a higher level. Still, the functionality of the evacuation system is the center of design, but we have been working on a better and easier implementation of the evacuation central. With new electronics, various components of the evacuation central can be transferred quickly and easily. Why a new evacuation central? Right now everything goes into one unit, which is fully tested as a whole. The new evacuation central is a different story. The device is adopted standing on its own and can be placed in any given housing. Additionally The Sound of Safetly looked into the possible implementation of the system on a international level. An imporant argument for the new evacuation central is that a different way of thinking occurs in the market. Nowadays you see a lot more system integrators who want to do more themselves. With the new product, we can supply evacuation centrals without a specific housing, so it is a solitairy device that can be incorporated into an existing unit. Is there a small unit? Then think about implementing audio, surveillance and fire protection only. You then have a unit that technically contains everything, which is attractive for small buildings. For example, large installations – such as airports and office buildings – are no longer replaced by a new system, but rather optimized and upgraded within the existing unit. Our new evacuation central is a system that can be implemented in the current situation, still meeting all the requirements. The new central is part of a evacuation system that is ideally suitable for small and medium-sized facilities. The TC8200 Compact is also ideal in a large building or complex, if implemented in the network. The evacuation cetral meets and exceeds all requirements of the EN54-16 standard, which ensures a safe and reliable alarm system. 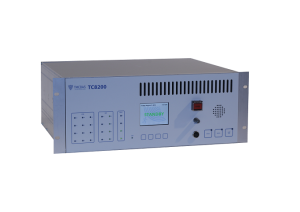 The TC8200 Compact consists of a central with a 400W amplifier, plus an additional 400W amplifier and integrated backup. Furthermore, it is possible to reset speech, alarm and even the connected slow-whoop zones. The recently redesigned control panel makes the control of one ore more conntected TC8200 centrals even easier. TC8200 communication BUS for advanced master-slave functionality. Besides the introduction of a new evacuation central, we are also introducing two new amplifiers. These will be available shortly. Both amplifiers are class D amplifiers. The advantage of the amplifiers of 400 Watt is that each zone can be loaded with 100 Watt. Which, among other things, is also new, is that these amplifiers are equipped with equalizers. Equalizers, also know as tone controls, are devices that can control the signal of a part of one or more frequency ranges. This means that the signal can be amplified or attenuated. Reflections in buildings create certain timbres. In a small room that has virtually no consequences. In contrast, in a large space – for example, a large atrium – it is difficult to keep a clear sound. By controlling certain frequencies, by surpressing or improving them, the tone colors can be optimized. Speech intelligibility is essential in project the speakers. This is an important technique which is compatible with the new The Sound of Safety amplifiers. The technique has been tested, with promising results. The technique in this amplifier can quickly make a night and day difference in sound in a large room. With the measuring equipmemt – an analyzer – tones can be measured easily. After measurement the adjustment of the sound can be determined. The difference can be audible immediately; because the adjustments of sound influence the reflections, the timbre changes and so a higher quality evacuation signal can be obtained. Sound is crucial for an evacuation system. People can be alerted through sound and be brought to safety. Speech intelligibility is extremely important, especially of messages provided through speakers. Messages must be audible, so that a proper evacuation can be accomplished. However, even if the sound is used for rother purposes, the speech intelligibility plays an important role. Take for example a train station where thousands of passengers come and go daily. These passengers costantly need to be informed about delays, dropouts and track changes. The messages are broadcasted through the speakers in the train station. Many of you will recognize, you usually don’t have a clue of what is actually said through those speakers. Train stations are acoustically troublesome areas for sound systems, but fortunately not impossible and an absolute challenge! Are you curious about the new evacuation central? Or want to know more about the new amplifiers? 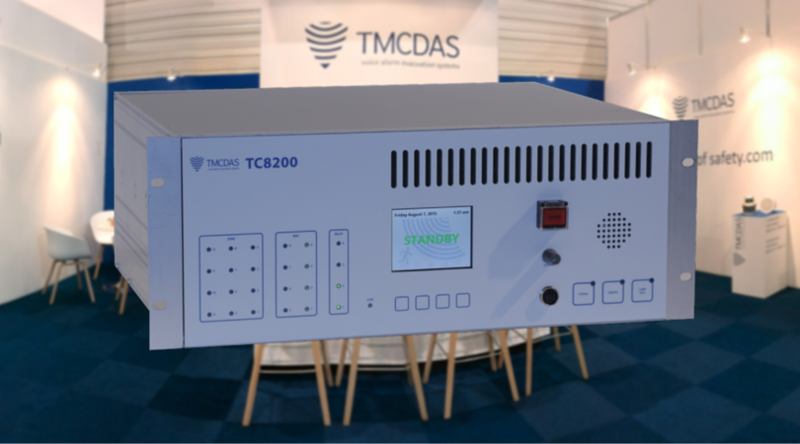 Please contant The Sound of Safety by emailing your inquiry to info@tmcdas.nl or call (+31)85 877 00 78. We’re happy to answer all your questions.